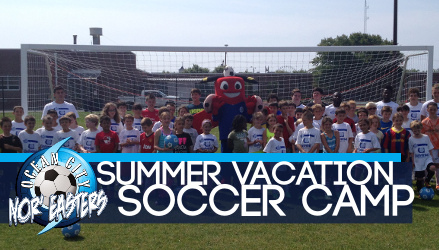 Established in 2005, the Ocean City Nor’easters’ Summer Vacation Soccer Camps have provided thousands of young players with the exclusive opportunity to interact with, and learn from, the players and coaches of South Jersey’s Premier Soccer team. Following a unique curriculum directly influenced by US Soccer, every Nor’easters camp provides players of all ages and abilities the appropriate level of coaching. This year's camp will take place at the Richard Grimes Sports Complex in Ocean City with camps beginning on June 25. Registration Fee: $115/player, which includes an Ocean City Nor’easters T-Shirt and Soccer Ball, as well as a game ticket for a Nor’easters match at Carey Stadium ("The Beach House").